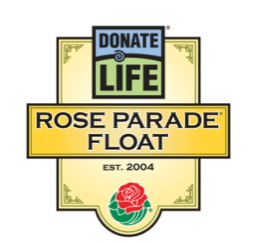 Donate Life America has joined efforts with the U.S. Air Force to honor Major Benjamin “Chex” Meier on the 2018 Donate Life Float, which will be part of the 129th Annual Rose Parade® in Pasadena. Now in its 15th year, the Donate Life Float is part of a national effort of more than 50 organizations that have teamed up to deliver the simple, lifesaving message that the kind and generous act of becoming a donor helps save and heal lives. Last week at Edwards AFB, Air Force Officials joined Major Meier’s family in a ceremony where his squadron finished the decorating of his Floragraph. The squadron added the word “Chex” on his uniform and signed the back of his portrait. This floral portrait, made of dried flowers, seeds and spices, will be placed on the Donate Life Rose Parade Float, to honor Major Meier’s memory and lifesaving gifts. Major Benjamin “Chex” Meier always wanted to be an Air Force pilot. He succeeded in his goal, flying combat missions over Iraq, Afghanistan, and Libya and saving many dozens of ground troops from hostile fire while under fire himself. His heroic actions earned him the 2013 U.S. Air Forces in Europe Daedalian award. In 2015, while on his morning run, Chex was struck in the head by the mirror of a passing truck. He was declared brain dead less than 24 hours later. He was able to donate his heart, lungs, liver and kidneys, saving the lives of five more people. Ben is survived by his wife, two young sons, two sisters and their families, as well as his parents, who will forever miss him. This year’s float entry, The Gift of Time, reflects the parade’s theme of Making a Difference, by celebrating the kindness of people throughout the world who are making a positive difference in the lives of others. Perhaps no act is more emblematic of this than becoming an organ, eye and tissue donor: a single organ donor can save the lives of up to eight people, and improve the lives of as many as 75 more by donating their corneas and tissue. 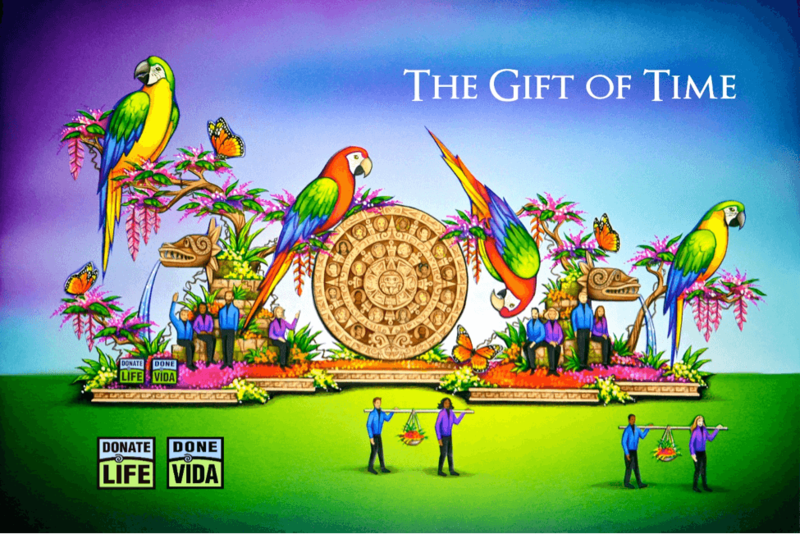 The Gift of Time float depicts a vibrantly colored, tropical backdrop that dates back to the ancient civilizations of Mexico. It celebrates the gift of life as transplant recipients sit against stone carvings reflecting the strength they have gained from their donors to continue and thrive on life’s journey. The float will also feature floragraphs honoring 44 donors who have made life possible. Eight living donors and recipients will walk alongside the float carrying baskets of fruit and flowers in celebration of the renewed life they have shared with one another and the world. For additional information about the Tournament of Roses please visit the official website at www.tournamentofroses.com. The Donate Life Texas (DLT) Executive Director (ED) is responsible for increasing the number of registered organ, eye and tissue donors in Texas, administering the registry and providing a unified voice for donor registration statewide. The Executive Director spearheads collaborative efforts, communications and outreach opportunities among numerous independent stakeholder organizations Individual state stakeholder organizations include: Southwest Transplant Alliance (Dallas, TX), LifeGift (Houston, TX) the Texas Organ Sharing Alliance (San Antonio, TX), several eye and tissue banks, and the Texas Department of Public Safety Driver License Division. Ability to convey natural sense of empathy and compassion for those who have lost loved ones or who are facing life-threatening health conditions. A comfort level with medical / surgical concepts, death and dying is required. Donate Life Texas (DLT) is the official organ, eye and tissue donor registry for the State of Texas. Registering with DLT is the only way to ensure that your decision to donate will be honored. By registering, you can record your legal consent for organ, eye and tissue donation after death. Many feel that registering is a compassionate step because it lifts the burden of decision-making off of family and loved ones during an emotional time. Donate Life Texas is part of the national Donate Life America registry network which is consulted by Texas organ, eye and tissue recovery organizations to confirm registration status when a person passes away. The Donate Life Texas registry does not cover living organ donation, living bone marrow, blood or whole body donation. Find resources for those options here. WHY IS DONATION SO IMPORTANT? Simply put, donation makes lifesaving transplants possible. Donated organs and tissues save lives, restore vision and improve mobility in ways that synthetic materials and products just can’t. Until the long-term viability and biologic function of organs, corneas and other tissues can be duplicated in a lab, transplantation will continue to rely on donors. February 14 is National Donor Day!